TOM GOULD, RIGHT, and two teammates attempt to prevent Livingston Manors Patrick Branning from scoring an easy basket in the recent Section IX Class D semifinal game at SCCC. 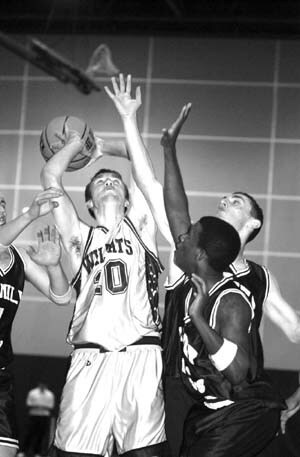 March 16, 2004  Editors Note: This is the first in a series of wrap-up stories about how county basketball teams fared this past season. Please see more wrap-ups in future issues of the Democrat. Top Scorers: Lee Lilly led the Falcons this season with some outstanding play. The senior averaged 12 points per game in The Family Schools race to sectionals. He was aided by sophomore Tom Gould, who averaged 10.5 points per game. Season Highlight: In a game at Fallsburg mid-way through the season, the Falcons returned from an 18-point deficit to win the game by two points. Season Lowlight: The team lost five of its players during the season. They were dismissed from the squad for violating school rules. Other comments: Coach Pat Simmons was proud of his team, which made it all the way to sectional play this year. In the Section IX Class D semifinals, the Falcons lost to Livingston Manor. They never quit, he said. They always gave 100 percent.